Every summer at the end of August, thousands of people from around the world make their pilgrimage to Burning Man, the signal counterculture festival of our epoch. Some come for a spiritual awakening, some merely to party and indulge, others to gawk at the spectacle. What started as a small summer-solstice gathering on San Francisco’s Baker Beach in 1986 has been refashioned as a major event drawing more than 75,000 festival-goers to the Black Rock Desert, a remote plateau desert two hours north of Reno, Nevada. Describing Burning Man to someone who has never been is an exercise in superlatives. Given its freeform, anarchic nature, it is to some extent what you make of it, and it has a different meaning to different people. Some regard it as the provenance of obnoxious trust-funders and rich techies; others, as the terminus of 1960s-era hippiedom. At a minimum, Burning Man resembles a more libertine Coachella, a giant drug-driven wardrobe malfunction bursting with alternate theories of don’t-tread-on-me hedonism and solipsistic schemes for freer living. There is general agreement that Burning Man symbolizes and perhaps even carries on the legacy of the socially libertarian spirit of the 1960s counterculture. Not surprisingly, attendees often describe the experience as transcendent; in recent years it has become popular with well-heeled techies, who have been credited with shifting the festival’s demographic and culture. Despite its transgressive spirit, the festival is expensive and increasingly off-limits to the underclass: Tickets run from $190 to $1,200 this year, while transportation to and fro and equipment add to the cost. Those who attend are expected to obey the organization’s “10 Principles of Burning Man,” which includes “radical self-reliance” — meaning attendees have to provide their own food, water and shelter for the week-long party. Over the years, the festival has attracted its share of celebrity fans, some of them unlikely: Grover Norquist, the anti-tax icon, attends regularly, as do many of Silicon Valley’s elite, including Elon Musk and much of the Google brass, along with Amazon chief Jeff Bezos. Burning Man’s remote desert location allows for unique experiences that one couldn’t replicate in other settings — in particular, the ritualistic burning of a giant human-shaped effigy at the end of the festival, from which it derives its name. It also means barbarous conditions for the seasonal workers who are tasked with constructing the grid upon which the festival operates. Salon spoke to several former and current employees and volunteers for Burning Man, who painted a picture of a dangerous and stressful work environment and a toxic management culture that contributed to a number of suicides of seasonal employees, at a rate far greater than the national average. Those who spoke exclusively to Salon recalled tales of labor abuse, unequal wages, on-the-job-injuries including permanent blindness and a management that manipulated workers who were hurt or who tried to fight for improved conditions. The videographer soon homes in on the clear leader: Caleb Schaber, who goes by “Shooter” on the playa. (Many Burning Man employees and regulars have “playa names,” nicknames they use only at Burning Man). As the videographer probes him with questions, Schaber tells a sordid story of employer malfeasance. Wearing a dark-brown goatee and with long, curly hair tucked under a beanie, Schaber resembles a plain-spoken Che Guevara. The coastal breeze sends strands of hair dancing around his face as Schaber grimaces and explains that more people wanted to attend his protest but were too afraid. “We had a lot of people who wanted to come but they got scared . . . some people get grants from Burning Man and some people still work for Burning Man, and if they find out who you are they won’t hire you,” he told the cameraman. Schaber was a full-time employee for Burning Man in 2003. Previously, he worked as a war photojournalist in Iraq and Afghanistan. Schaber had quit his seasonal job at Burning Man but continued to work as a volunteer and to fight for worker rights in Burning Man’s Department of Public Works — the internal name for the division of seasonal workers who build the bulk of the infrastructure that allows the desert festival to function. These workers — his friends — had been taken advantage of by an organization that was meant to represent a rebellion against what “the man” represented, Schaber said. A friend of Schaber’s, an unidentified female seasonal employee of the Department of Public Works who asked to remain anonymous for fear of recrimination, was particularly alarmed by the company’s reaction to the protest in 2007. “The people that were working in the building just had the most smug response to it,” she said, adding that the events that led to the protest showed the “first real sign of disconnect” between upper management and its employees and volunteers. “It was very strange,” she said. Ricardo Romero, 35, began working with the DPW in 2008. He had originally volunteered with Burners Without Borders, assisting disaster relief in Pisco, Peru after the 2007 earthquake, where he met a DPW manager who offered him a position on the playa. Romero told Salon he was a volunteer at first. “I never asked for much money, kept my head down, kept my mouth shut, respected the authority,” he explained. Still, what he saw happening troubled him. “Over the years I just kept on seeing so many of my co-workers getting fired for complaining about worker treatment,” he explained. Romero says he heard from others that if they compared pay — which varied wildly, depending on management’s whims — they could get fired. “I’d hear things like, ‘That person got fired because they stuck up for someone or called out some abuse that they witnessed,’” he added. Romero had been talking to workers about possibly organizing a union, in an effort to fight back against their treatment and get more transparency about wages and wage differentials. In April 2017, he received a call: He was “uninvited” to return to Burning Man. It would have been his ninth year. Right before he was "uninvited,” Romero suggested that some of his colleagues refrain from signing their contracts to protest mistreatment. If that's why he was fired, that would likely violate national labor laws. Romero added he believes that Burning Man’s claim they did not want to go through the “time-consuming process of litigating it” is contradicted by management's decision to hire two large law firms. One is Jackson Lewis, which has a reputation for union busting. Romero was represented by Kevin Brunner of the law firm of Siegel, Yee and Brunner, an Oakland firm whose attorneys have a long legacy of civil rights and labor law. 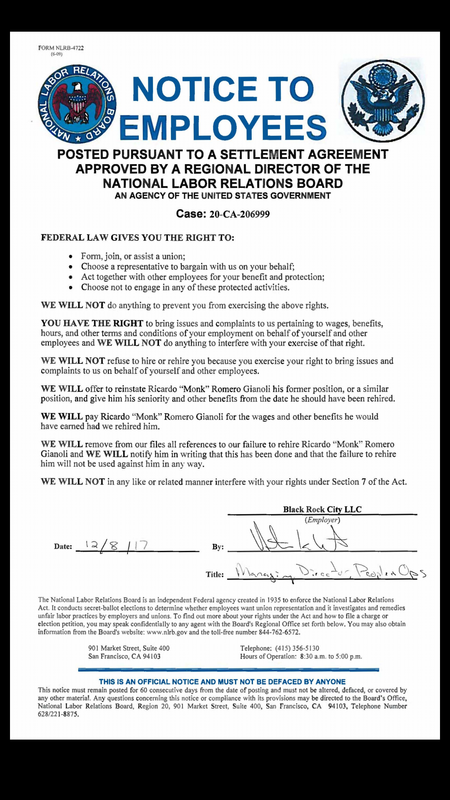 It is illegal to fire someone for trying to organize, Brunner told Salon, saying that in his judgment Romero’s case was cut-and-dried. The NLRB agreed with Romero, and the Burning Man organization was forced to issue a statement. Romero, ultimately, got a settlement that both he and his lawyer were happy with. “Part of the settlement was they had to rehire him and then post those notices and pay him back pay,” Brunner told Salon. The company was also obliged to make an official apology and post a notice to its employees, which Salon obtained. Romero’s victory does not mean that the labor woes of Burning Man are over. For one thing, there is still no union on the playa. Burning Man as a festival and a nonprofit prides itself on its "10 Principles" and promotes them rigorously — a set of values that include “radical inclusion,” gifting, decommodification and civic responsibility, which could factor into the blurred lines within the organization. Yet there is a steep differential between the salaries for the workers who make the festival run and the upper management: Romero told Salon he was offered $15 per hour to work this season. According to 2016 tax filings, salaried managers earn between $150,000 to $200,000, more than four and a half times Romero’s wage. Women who worked at Burning Man spoke of observing gender inequities in wages. Ridge Arterburn was a Burning Man volunteer working for the DPW from 2007 to 2014 (with the exception of 2012). “In ’15 I was asked to not return,” she told Salon. Arterburn said that there was a gender gap where her paycheck was concerned. Annie Bond, 28, began working at Center Camp Café in 2012 and corroborated reports of gender discrimination. At first she was under contract by a vendor working at Burning Man, but she got poached by the Burning Man organization. She dated her manager, who promoted her as his assistant, but after they broke up, she quickly realized where the organization's priorities lay: with her ex. “Previously we had a great working relationship and it seemed really infallible and strong, and all of a sudden he was not talking to me; he would put me on hold on the radio and never come back, and he wouldn’t tell other departments I was his assistant," she said. Bond was told a position was waiting for her, after she decided to take a year off, but the following year she was told the organization didn't have a budget to rehire her. Bond said she agreed with a friend who said Burning Man culture was pervaded with "toxic masculinity." There was "manipulation through, you know, various forms of male-generated power of persuasion,” she explained. While Romero was lucky to get a settlement, many Burning Man employees who were fired unjustly or mistreated by the company weren’t so lucky. Two years after Schaber’s protest, he died. The official cause of death was suicide. It is one of many that have rocked Burning Man’s Department of Public Works over the last decade. Deaths in the DPW are so common that the manual distributed to workers each year — which can be found online — includes a section dedicated to those who have died. There is also a memorial in the DPW saloon at Burning Man. “It has over a dozen pictures of people who killed themselves or have tragically killed in a car accident . . . but the majority of them are suicide,” Arterburn explained. Many of Schaber’s friends and co-workers believe that the way he was treated by Burning Man after challenging its labor practices was a contributing factor in his death. “If I had to guess I’d say that, yes, being ostracized from DPW is very painful,” Arterburn corroborated, adding that Schaber was “troubled” before he died. Salon found that in the seven years between 2009 and 2015, there were seven DPW worker suicides in the department. That number is statistically significant enough to be alarming, according to Dr. Sally Spencer-Thomas, a psychologist and the lead of the Workplace Task Force for the National Action Alliance for Suicide Prevention. “To give you a benchmark, in a community of 1,000 people we would expect one suicide death in one decade,” she explained. Spencer-Thomas noted that the construction industry in the U.S. does have an elevated suicide rate. Ryan Brown, 40, whose playa name was “Cave Man,” died in 2014, He was a friend of Romero, who was involved in the events that led up to his suicide. At 2014 Burning Man, Romero said there were fears that Brown would become violent with his wife, though Romero stressed there was no apparent history of domestic abuse in their relationship. “He progressively got more and more distressed, and he felt like nobody was communicating with him honestly,” he said. Salon reached out to Brown’s widow for comment, but she declined to comment. Romero encouraged Brown to leave the playa on his own terms when matters escalated. Romero says a dramatic removal during Burning Man is sometimes warranted — if someone is attacked or sexually assaulted, for example — but in Brown’s case, Romero believes his firing was handled poorly. Management asked Brown to leave, according to Romero, and the events that followed led to his tragic death: Brown reportedly went on a drug and alcohol bender and was arrested on suspicion of reckless driving and possession and use of cocaine (He drove a car through the lobby of a hotel). A few days later, he was found dead in his hotel room. The coroner ruled the death a suicide. This was not the first time Romero had witnessed upper management remove someone from the playa in a way that could affect the person’s mental health. Because of the unique and tight-knit nature of the Burning Man worker community, getting fired can be particularly devastating, as many workers have never felt that level community or camaraderie in any other aspect of their lives. According to Romero, the experience creates potentially dangerous highs and lows. On Facebook in 2014, Brown posted a photo of himself with a certificate from an outpatient addiction program. His friends attest that working on the playa was a form of healing for him, and Romero asserts that management knew that they had a mini-epidemic of suicide among their workers. “At [the] point [that Brown died], suicide was a problem," he said. It can be "a traumatic experience for people just to leave there on their own will after their contract is over," he continued, "let alone to be fired and separated from a million people who you feel accept you — and also maybe your spouse – all in one day.” Romero said he doesn’t blame Burning Man management for Brown’s death, but is still upset that nothing was done to mitigate a dangerous and escalating situation or to handle it more carefully. Eric Close, whose playa name was “Myster E.,” was “one of those people that was trying to get out of pain," according to Schaber's friend, a DPW member who would not give a name for fear of recrimination. Close worked at the DPW until spring 2004, and worked “very closely with upper management” to provide employees with housing at a trailer park in Gerlach, Nevada, the nearest permanent town. Close may have had an opioid problem, a DPW member recalled, but was also under stress at work. “I wasn’t sure when the problem developed, but I remember him being stressed out working for [Burning Man], saying that he didn’t feel like he was earning money to do what he [wanted to be] doing because he was always working,” she said. Close and Schaber were good friends, and they reportedly had more in common than Burning Man: a desire for community. The kind of people who are attracted to work in such an extreme and isolated environment may already be struggling, as Brown and Close were. "The ethical part is that employers need to look in the mirror and ask, if you knew there was something you could do that could make a difference, why aren’t you doing it?” Spencer-Thomas of the National Action Alliance for Suicide Prevention told Salon. Romero requested a meeting with upper management to discuss DPW issues, but they asked him to create a “survey” for the department instead. “Upper management was not happy with what happened next," he said. The survey was posted to internal DPW online social media and then to a DPW Facebook page, and then it appeared on a public website. Given that cell phone service and internet access is generally unavailable on the playa, this benefit was largely useless. In 2016, Romero advocated to extend the EAP benefits, which included a work-based program designed to identify and assist employees with personal problems. “After I advocated that they extend them to the rest of the year -- I don't know if I caused that, but they then extended those benefits to one year from date of hire,” Romero said. Yet the most egregious instance of on-the-job injury came in 2014, when a Burning Man Ranger named Kelli Hoversten was permanently blinded by a laser, disabling her for life. Rangers, volunteers who help patrol and manage the playa during Burning Man, are a crucial part of the festival's logistics. Rangers frequently intervene in dangerous situations and prevent them from escalating to the point where a law enforcement agent might need to be involved, often assisting intoxicated guests or providing help to lost or confused Burners. On Aug. 30, 2014, Hoversten, in her capacity as a Ranger, was working as a “Sandman” — Burning Man terminology for the Rangers who wear heat-protective gear and ring the central effigy that is ritualistically burned on the final Saturday night of the festival. Sandmen constitute the last line of defense between attendees and the raging fire that results from the burn; occasionally, a deranged or drugged participant slips through their perimeter and perishes in the blaze, as one man did as recently as 2017. On that night in 2014, Hoversten stood with her back to the burning effigy, as she had been instructed, to monitor the revelers and prevent people from getting dangerously close to the burn. The eminent danger to her health turned out not to be the fire behind her but the lasers shone in her face by participants in front of her. When Hoversten realized something was wrong, she signaled her flashlight to the ground to her partner in the department. She quickly got in an ambulance and went to the main medical center on the playa. She now knows it would not have made a difference if she received instant medical attention, as the damage had already been done. Today, Hoversten is permanently blind in her left eye and has damaged vision in her right eye that continues to deteriorate. Sandmen wear goggles at Burning Man today and handheld lasers have been banned, although lasers on top of art cars are still allowed. Prior to Hoversten's injury, she was an arborist and worked on her parents’ farm. Since then, she has loss her personal sense of freedom. Her future plans to take over the farm are gone. “My mother’s exact words are ‘Burning Man ruined your life, they took your life away, you have no freedom,’” she said. “And I don’t — I can’t — you know, I was an outdoor person. I did all kinds of things I can’t do anymore. The events that followed the accident made Hoversten’s recovery process more difficult. After being injured, Hoversten contacted the Nevada state workers’ compensation system. According to Nevada state law, volunteers are eligible to file when injured while volunteering, though this is not the case in every state. Nevada state law also requires that when an injured worker receives workers’ compensation, he or she cannot sue the employer. Hoversten connected with an executive claims consultant, as directed by Burning Man, who told her to file her claim in Missouri because that is was her permanent residence, advice she now says was legally incorrect. She says she was never told that there was a 90-day filing period in Nevada. By the time she figured that out, it was too late to file a claim. Six months after the accident, Hoversten’s medical bills were piling up. In March 2015, one of her friends set up a GoFundMe to try to help her cope with the cost. At that point, Burning Man management finally took notice and offered her a $10,000 anonymous donation, attached to a nondisclosure agreement. A standard life insurance policy will generally pay $250,000 to someone who is rendered legally blind in both eyes on the job. Hoversten had two weeks to accept the offer, which she says turned into two weeks of harassment by an employee in the human resources department. She did not accept the offer. During this time, she claims a Burning Man employee tried to hack into her GoFundMe account to alter the copy to specify that Burning Man was helping her out financially. “That was a flat-out lie. They had not done anything for me financially at that point,” she explained. Eventually Dubois responded, and Burning Man opted to pay for Hovensten to have a life coach for two years. Hoversten still volunteers as a ranger at Burning Man; she is likely on the playa as this article is published. “I still believe in the [Burning Man] community and the service of the volunteers as a community,” she said, adding that there is a disconnect between upper management and those who run the festival — a gulf that appears to be widening and might hurt the festival in the long run. “If they don’t start caring about their volunteers and treating their volunteers like we are human beings and have worth, eventually they are going to run out, and they won’t get the people who have been volunteering since the beginning,” she explained. Hoversten is not the only one who still finds value in the Burning Man community. Bond, who worked at Center Camp said she wants it to be "wonderful and beautiful again," but that would require changes in upper management. "How do you get people to not abuse their power?" Bond asked. "It feels like there needs to be a shift in the alignment of their moral fibers." When asked about the way Hoversten’s case was handled and whether or not she was told the truth regarding how to proceed with workers’ compensation, Burning Man declined to comment. Graham, the Burning Man spokesperson, told Salon that lasers have been banned since her injury, with a few exceptions. “All lasers are banned at the Man Burn,” he said. The late Larry Harvey, Burning Man’s co-founder, laid out his vision for Burning Man in the aforementioned document now known as the “The 10 Principles of Burning Man." In it, Harvey describes Burning Man as being guided by a vision of "radical inclusion," "decommodification" and “civic responsibility." “We believe that transformative change, whether in the individual or in society, can occur only through the medium of deeply personal participation,” Harvey wrote. Burning Man is intended to be a utopian celebration, a break from the banal routine of a capitalist work culture, an event that is radically inclusive to all who desire to express an authentic part of themselves that is not accepted in what Burners call the "default world." Ironically, and perhaps inevitably, the festival appears to have replicated the very problems it sought to transcend. Burning Man set out to burn “the man," but in many ways it has become the man.